Are you looking to recognize that indespensable assistant? Are you a 12th grader majoring in Business in College? This scholarship offers $500! Are you a member of PAEOP? Are you looking to complete your PSP or complete more professional development? Click the link to apply for this member Scholarship! If so, notify us of your new address or contact information so you don't miss any PAOEP information. Don't miss out - grab a friend and come enjoy the 2019 Spring Conference. The latest issue of PEPTalk is out! 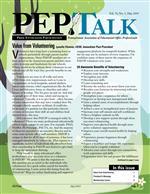 An invaluable resource for PAEOP Members, PEPTalk is located in the Member's Only tab above. Log in to view the current issue today! The mission of the National Association of Educational Office Professionals (NAEOP), is to provide professional growth through leadership, education, achievement, recognition, and networking opportunities for educational office professionals. It is the intent of PAEOP to post information on our website that is compliant with the Americans with Disabilities Act. We are now in the process of updating our content to be compliant with the W3C guidelines. It is our goal to develop a website that is accessible to everyone. If you have problems accessing a page on this site, please email the webmaster with the specific URL to inform them of the page you are unable to access. Check out what other members had to say about 2018 Spring Conference!